*Editor’s note: This establishment is now closed. Recently, my food writer friend A, told me about this little sushi place tucked away in the confines of the BF Homes area. She seemed quite taken with the place and recommended that we schedule a visit to Sushi Sei at the soonest possible time. And this was exactly what we did one Saturday evening. C and I joined a group of friends and made the trek from Makati to Paranaque. With the Skyway, the trip was quite painless and we were at the little 12-seater restaurant in no time. Owner and Sushi chef Seiju Ohnami, who says he has worked all over the world, put up Sushi Sei recently. He focuses mostly on fresh local seafood and some meat dishes as well. Our group decided to have the Omakase or tasting menu for P1500. Chef Ohnami actually decides what to serve based on what is freshly available for the day. We started with Soya Simmered Baby Smelt with Mentaiko or Cured Cod Roe. It was a very good start to the meal, with the Mentaiko providing perfect contrast to the slightly sweetish smelt. The Sashimi course followed next. 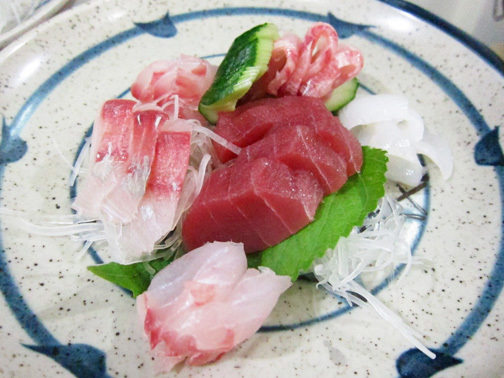 There were slices of Tuna, Maya Maya, Flounder, Squid and my favorite Engawa or the side muscle of the dorsal fin. Chef Ohnami has his own formula for his Soya dipping sauce. It was not too salty and had some depth to it. I was disappointed with the commercial wasabi paste that was served though. Some fresh grated wasabi would have been a better alternative in my book. My least favorite dish for the evening came next. 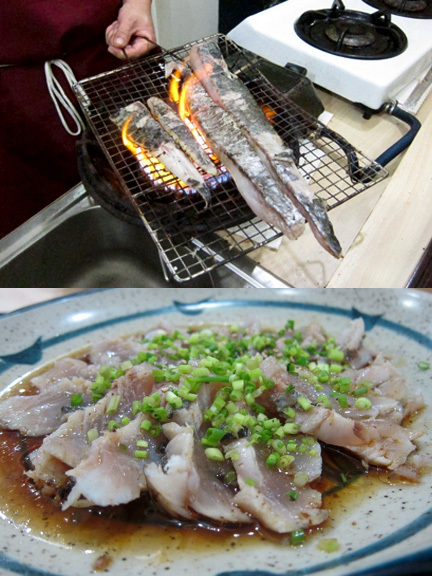 Slightly seared Kingfish (Tanguigue) with Ponzu sauce and spring onions. I have never been a fan of Tanguigue as I find it a bit dry and bland in general. Of course exceptions in the form of Ceviche or Kilawin are always welcome. At this particular instance, however, I found the dish lacking in oomph. I was hoping that the ponzu sauce would compensate but it was really not meant to be. For our Nigiri Sushi course, Chef Ohnami offered each piece with a different type of sauce that he applied lightly using a sauce brush. These different sauces subtly added a different dimension to the sushi. I must say I enjoyed them thoroughly as they were quite tasty. 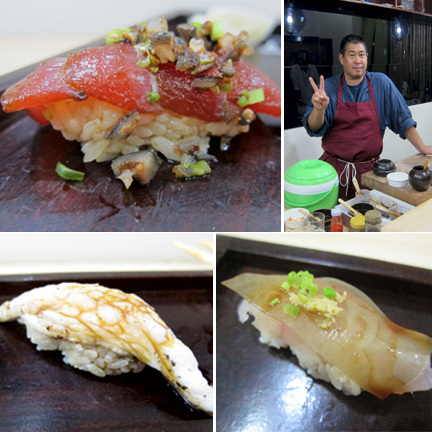 We had Tai/Snapper Sushi with a sauce made from the innards of the Bonito fish. Next we had Hirame/Flounder with molasses topped with a translucent seaweed sheet. Tachiuo/Swordfish/Espada with a Unagi Sauce then followed. Lastly, we had Tokyo style Maguro Zuke or Tuna soaked in a soya and vinegar marinade. This type of Sushi was quite popular during the Edo period, as marinating the fish would give it a longer lifespan. Our omakase experience left me quite impressed as everything was extremely fresh. A return trip is surely merited to try some of the meat offerings and to revisit old favorites. Volume may be a problem for growing boys and girls like me though. I felt a little “bitin” after. This was the general consensus of the group as well. Personally, I would have added a course, even if it had merited a slight increase to the cost. Still, this “little sushi place that could” comes highly recommended for its fresh offerings and reasonable pricing. Heading there again tomorrow. I completely agree about the fresh wasabi and that is something my group discussed as well. In an eatery like this, commercial wasabi has no place. I think he should have menu options- 1500, 2000, 2500 etc. I will suggest it to him. Even a nice hot soup would be good. The sushi counter at Inagiku does a nice filling miso-based soup with the fish from the previous day and adds some tofu and seaweed. That alone would help fill those "growing boys and girls." Hi Alicia, Let me know how your visit goes. Thanks for stopping by. Our free application on Ovi!